So I have a confession to make….if you know me well, you may already know this about me….but I do not like cream cheese. I think it is among the most vile things in this world. I know…some of you may not want to be friends anymore (Caroline, I know you love cream cheese frosting)….I hope you’ll still get on board with our version of paleo carrot cake muffins. Given my deep-seated loathing of cream cheese, I really never gave carrot cake a fair chance until going paleo, and not having to worry about the cream cheese factor showed me the beauty of carrot cake. Thank you paleo for opening my eyes to this spiced, carrot flavored yumminess! 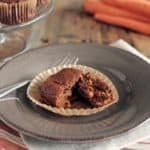 These paleo carrot cake muffins are so delicious. The texture is just right and the flavor is well balanced between the sweet and savory ingredients. The end result is a hearty muffin. You can see the texture and the dimension the carrots add. 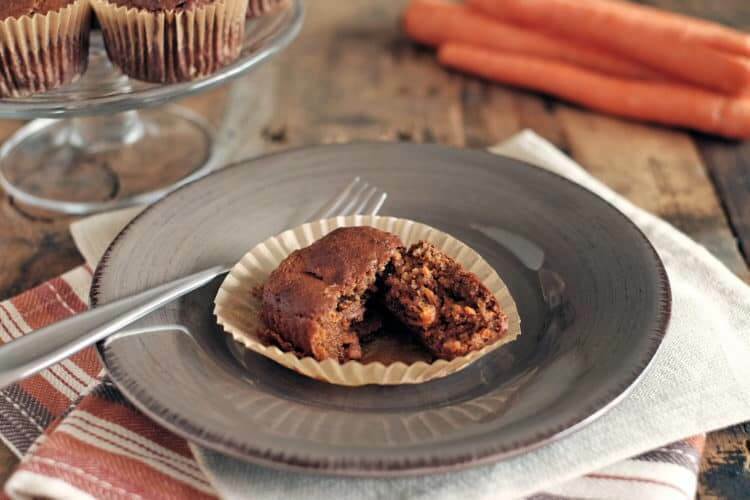 You really can’t beat the aroma, flavor and texture of these paleo carrot cake muffins. Give them a try, and let us know what you think! We’d love to hear about it! Tag us on Instagram #realsimplegood when you make them! Preheat your oven to 350 degrees fahrenheit and line a muffin pan with parchment or silicone liners. In a large mixing bowl, whisk one egg. Add the almond butter and stir the egg and almond butter together. Next add your date paste, mashed banana, melted butter, molasses and nutmeg, and stir the mixture again until everything is combined. Pour the almond flour in and stir everything together again. Add the baking soda and apple cider vinegar. Pour the apple cider vinegar on the baking soda so it gets fizzy. Fold the grated carrot into the batter. Spoon the batter into your lined muffin pan so each muffin liner is about 2/3 full. Place your muffin pan in the oven and bake at 350 degrees for about 27 minutes, or until the edges start to brown and a toothpick comes out clean. Remove from the oven once done and let the muffins cool. Eat up! 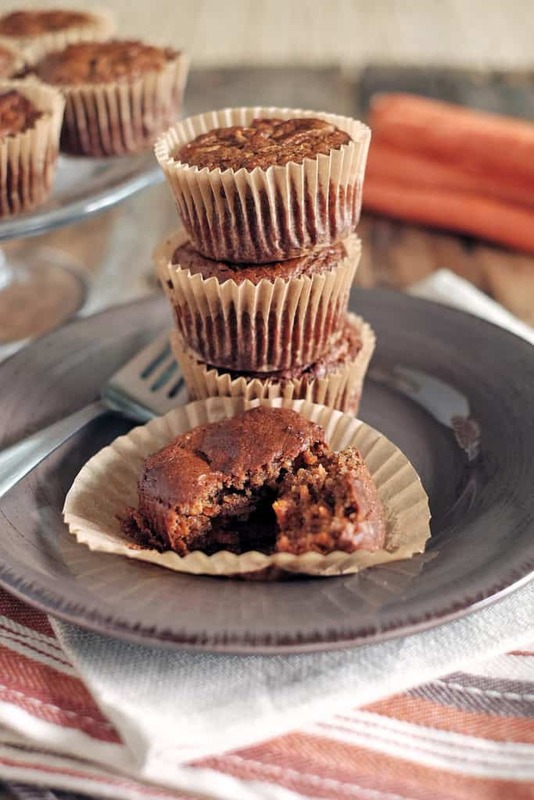 These paleo carrot cake muffins are a hearty and soul-satisfying breakfast or snack. I love muffins. These look really good! I’m a pretty big muffin fan, too! I think Justin is even coming around to them as well since I like to make them often. You’ll have to stay tuned this week for a cupcake recipe! The cupcakes can be eaten as muffins themselves without all the toppings! Hope to see you again on here soon! Thanks for visiting. Oh yum! These sound delicious! Love that you used dates in them. Thanks so much for sharing this with us at Savoring Saturdays linky party. Hope you’ll come back this week.